Last evening was long but it was fantastic. I had the pleasure to see and experience the presence of Deepak Chopra. He is absolutely incredible. He explains consciousness so that a nine year old could understand It; in a well formatted progressive manner without a whole lot of jargon and big words. 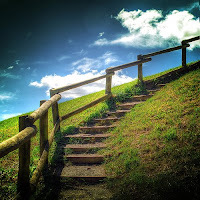 It was like taking 'the stairs of understanding' to a deeper state of consciousness. If we want to change the world we must first shift in our own consciousness. We will then be a reflection of light cast onto the world around us. Many of us try to change the world without changing ourselves but only the reverse is true. Why is this so true? Because when we dwell in the deeper state of consciousness, the closer we are to union consciousness; which is manifestation of peace, love, harmony and joy. When we understand that the world is in us and that we are not of this world, we will 'be' local and non-local at the same time, or spirit and physical at the same time. We realize the world is our extended body. The rivers are our circulation and the trees are our lungs. We share the same breath of life with each other all over this cosmic universe. We begin to feel less restricted and limited, and are intoxicated with love. Who we are can change the people around us without us being affecting by others' limiting perceptions. When we do not know our True Self we are disconnected and we are at the mercy of others' emotions and behavior. We also remain in the ego. The ego likes certainty and addiction. It also likes security, attachment, sameness, predictability and seeks instant gratification. When we dwell in unity consciousness, we know we possess infinite possibilities, we know everything because we have access to the unlimited field of consciousness of knowledge, we welcome uncertainty, we are infinite creativity and we take responsibility for co-creation. Many mansions means many states of consciousness. What state of consciousness are you at? Are you under the control of your or others emotions and behavior? Or are you at One with Life? Do you see and feel consciousness in the words you read, the ink on the paper, the book you hold and the chair you sit in? Consciousness is everything; what was, is and will be. It is All That Is. Every molecule, cell and atom is consciousness. Grasp that, for that is Truth.